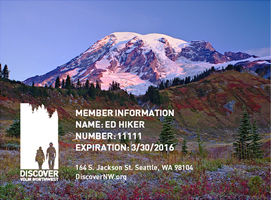 When you become a Discover Your Northwest member, you enjoy 15% off your online orders throughout the year! That same discount is recognized at all of our public lands visitor center stores across the Northwest. Your DYNW membership also entitles you to similar discounts at our sister organizations around the country. Most of our nonprofit partner associations from the Redwoods to the Smokey Mountains and from Grand Canyon to Denali honor each other's member discounts. By becoming a member, you are also supporting places rich in regional culture and history. Your support helps ensure that programs continue to educate visitors and encourage them to become stewards of our Northwest public lands. Their future depends on people like you who understand and believe in their value.